This new ebook from Kitchen Stewardship is getting plenty of positive buzz out in the Real Food/Nourishing Traditions blogosphere, and now that I have purchased and started using my own copy, I can certainly see why. This little ebook filled with over 45 recipes yummy AND healthy snacks that the whole family will love, including dozens of variations for something called Lara Bars. We don't have Lara bars here in Perth, so I don't know what they are meant to taste like, but the ones we made were absolutely delicious, and were wolfed up in seconds by the kids. Other recipes include portable backpack/diaper bag friendly granola bars, cookies, muffins, fruit roll ups etc, as well as lunchbox friendly side dishes. What I really loved about this book was the variations for those following Nourishing Traditions such as using soaked grains and nuts. 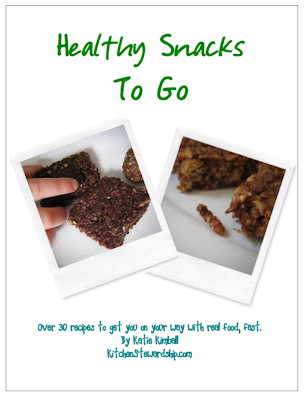 I've been making a lot of head way eating this way, but finding easy snacks (that the kids like) to replace processed snacks has still been a bit of a challenge, so this book has been a real lifesaver. Go here to purchase this great little book!